LEGO’s Technic Tow Truck 42008 hit the shelves this year, and a very nice model it is too. But what if your mini-figures want to have a go? MOCpages’ Andy L re-imagines what what 42008 would look like if it were about four times smaller (*hence the title – we’re teaching the Elves maths). With room for two mini-figures up front, Andy’s 7-wide version of the official Technic set looks the bomb-diggidy, and it even includes some of the real set’s Technic functions, including 4-wheel steering, a raising and lowering boom and a working winch. Come on LEGO, we’d love to see some Town sets with these playable functions! Until LEGO oblige us, check out Andy’s brilliant 42008 redux on MOCpages at the link above. Creations for Charity 2013 – Donations End Today! The deadline for donating a creation to the 2013 Creations for Charity event expires today! If you’d like to donate a creation to this year’s charity auction for underprivileged children, please make sure you do so asap today. At the time of writing there are almost 130 donated creations in the Creations for Charity auction, including many vehicles, several of which have featured here on TLCB. To see what’s available, and make a bid on one or more of the donated creations, check out the auction at the Creations for Charity 2013 Bricklink store by clicking on the link below. Join the Creations for Charity 2013 Auction here! Creations for Charity 2013 is here! Creations for Charity – a superb charitable event that raises money to buy LEGO sets for underprivileged children – is upon us for 2013. It’s a fantastic cause, as with many charities, but it’s how Creations for Charity raises funds that sets it apart. Money is raised to purchase the toys via the donation and sale of custom LEGO creations, built by some of the best LEGO builders around (some of which have featured right here on TLCB). All the proceeds go to purchasing LEGO sets for needy children, which are then distributed throughout the U.S and other countries, children who otherwise would not get anything to play with this Christmas. LEGO is the perfect toy too, as it can be played with for years without breaking, without batteries, and has no age, mental or physical limitations. You can help this amazing initiative in a number of ways; by publicising Creations for Charity, donating a creation, or bidding on one of the awesome creations available in the auction. To find out more on how to participate please visit Creations for Charity 2013 here. If you’d like to donate a creation the deadline for signing up is the 15th November. All the details of how to donate, bid and buy can be found at the link above, and we’ll bring you some of the best vehicle-related creations submitted to the auction here on The Lego Car Blog in the coming weeks. After their adventures with the 31005 Construction Hauler and the 31006 Highway Speedster, we thought that the Elves would like to practice their nascent building skills on something a bit more challenging. 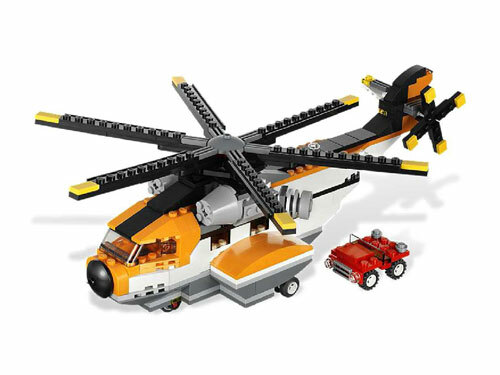 The 7345 Transport Chopper’s RRP is double that of the previous two sets at £24.99 from Lego.com, though we bought our set for £20.00 from Amazon. Inside the box, you get 5 bags containing 383 pieces, which amounts to ½ kg or 18oz of LEGO. This compares very favourably with the price per kilo of bulk, unsorted LEGO on eBay. Being a Creator set, you’re also getting the months of design effort from LEGO’s team, plus printed instructions for three different models. Value for money? Excellent! The first stage of building, as usual for the Elves, is to rip open the bags and send parts flying everywhere. Next comes the part where we fish bricks, plates, tyres and greebles out of the TLCB executive jacuzzi. The final stage is where assorted Elves batter each other with the larger and pointier components, until they are settled down with a blast from the air horn. You can understand why we haven’t let them build anything from Technic, with all of those spiky axles and cogs. The three models are rated as “Quick”, “Medium” and “Advanced” builds. The helicopter is the “Advanced” build and seems to be completed in just 56 steps but there are several extra sub-builds within this, plus another 8 for the little red jeep. As usual, some of the steps only add a couple of bricks to the construction but we have to remember that the target age range is 8 to 12. We built the jeep first and gave it to the Elves to zoom around in, whilst we got on with the serious business of building the chopper. As this set is aimed at younger builders, it’s a bit annoying that you have to use parts from four different bags to complete the first three stages of building the jeep. Perhaps this sub-build could be in a separate bag and the rest of the parts could be in numbered bags, like some of the other LEGO product ranges? Nathanael Kuipers’ original Build-It Book (publicised here earlier in the year) featured instructions and designs for 10 amazing vehicles which can be built using the same palette of bricks, and is a great way to learn to build more from what you have, or to teach builders how they can use the same pieces in different ways. Nathanael recently posted a preview of the follow-up Volume 2 (‘More Amazing Vehicles’) on his MOCpages account, and to TLCB office at least, it looks reassuringly ‘Godfather Part II’ rather than ‘Speed 2’. Nathanael’s sequel contains instructions and ideas for another 10 great vehicles that can be constructed from the same basic parts, ranging from a hot rod to a fork lift, and with everything in-between. To see further details on what’s inside Volume 2 and to buy your copy, visit the No Starch Press website. Technic Man is our kind of builder; his MOCpage is full of properly engineered Technic vehicles. His latest prompted several of you to contact us via The Lego Car Blog Feedback page to ask if it could be featured here, so here it is! This MAN TGX truck is a good model in its own right, but is even more impressive when you discover it’s built solely from the parts of LEGO’s 2013 41999 Rock Crawler. And for that, we like Technic Man even more, as many of LEGO’s 41999 sets will stay unopened in the basements of speculators and collectors, never to see the light of day or feel the hands they were designed for. You can read our review of 41999 here, and if you own one, take a leaf out of Technic Man’s book, and have some fun with it! Designing and sharing creations is what the Lego Community is all about. ‘MOCing’ as it’s known is what makes LEGO the world’s best toy. There’s no trick to it; put a pile a bricks in front of a 3 year old (or a Lego Car Blog Elf) and they will instinctively and intuitively begin to build, although staff here don’t blog their own MOCs, as then you’d know who we are! Besides MOCing however, many members of the Lego Community would love to build and own some of the amazing creations that have been designed by builders who don’t work for The Lego Group. Creations such as Crowkillers‘ Lamborghini Gallardo above and this incredible remote control Tow Truck by Dirk Klijn shown below. Dirk has made instructions for his spectacular creation available through crowkillers.com, where it’s joined by another 9 amazing models by Paul Boratko (aka Crowkillers), Nathanel Kuipers and Jennifer Clark. Pricing ranges from free to $15 and instructions come in the form of a PDF download. Click here to see the full range of model instructions currently available. Paul ‘Crowkillers’ Boratko has also very kindly accepted a visit by our Elves, who thrust a Master MOCers voice recorder under his nose. Read Crowkillers’s story in the fourth instalment of TLCB’s Master MOCers series here. Ever since they ripped open the delivery bag and saw the cover art on the 31006 Highway Speedster, the Elves have been playing the Miami Vice title music. Fortunately it’s on a TV Tunes of the Eighties playlist and we get to enjoy the Airwolf theme every now and again. Sharp little fingernails had soon ripped open the four bags of parts, eager to be zooming their white Ferrari lookalike across the floor and handbrake turning it on the tiles of the TLCB executive washroom & sauna. Once we’d helped the Elves rescue the tyres from under the TLCB deluxe minibar, they set to work on the 61 stages of the main build. As with the 31005 Construction Hauler this might seem like a lot of stages but this set’s starting age is just 7 years old and so the number of steps is understandable. Having said this, Step 61 is to turn the car the right way up, which even the Elves managed without getting too confused. All three builds in this set follow a basic, studs up configuration, with some touches of SNOT work. The chassis for each of the models are two 16 stud, old-school Technic beams and the car gradually builds up using an impressive selection of slopes, curves and cheeses. The rear end has the most SNOT with a nice, Ferrari style lighting bar and a lifting glass cover for the engine. Disappointingly, the engine is perhaps the weakest part of the build, being made from just six 1×1 round plates and a couple of 1×2 grille tiles. There’s space for a lot more and it’s a great opportunity to do a bit creative building. The Elves got very excited at step 44, with the addition of a 1×1 round tile in trans-red. This sits inside the air scoop on the bonnet, almost like KITT’s sensor, which provoked a change of 80’s theme music for a while. Further steps build and attach the working, supercar style scissor doors and more body trim on the front of the car. This includes a neat front light cluster, which uses minifigure brackets for some SNOT. Surprisingly the wing mirrors aren’t colour co-ordinated with the rest of the bodywork, something of an omission for an expensive looking supercar. The glass roof neatly seals onto the windscreen, though the cockpit is hard to see into. This is no bad thing, as it is very sparsely furnished. Once the wheels are added, you’re left with a 10 wide by 22 long sports car. The build quality is well up to sustaining the odd crash into a skirting board or tumble from a table. The axles through the chassis (as opposed to clipped-on wheels) and low centre of gravity, give great performance for zooming across carpets in a straight line. The Elves managed runs of over 7 metres along the TLCB decking. 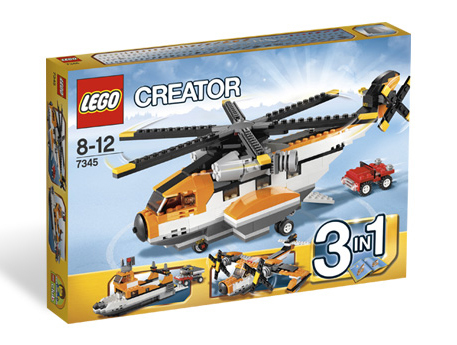 As with other sets in the Creator series, this set comes complete with an instruction book for each of the three builds. This will be a relief to parents and Elf keepers alike, as they’re spared the task of having to download and print instructions from Lego’s website. It’s a horrible sight to see an over-curious Elf dragged into the giant TLCB Lego instructions printer and rolled out flat on the other side. Apart from the waste of paper, it takes forever to get the pipe into their mouths to pump them up again. The second build is a 16×8 tow truck. Again, this is a mainly conventional, solid Lego construction. A nice bit of SNOT work converts the sports car’s low profile windscreen into a flatter screen on the truck and clips it on quite neatly. The crane moves, pivoting on the back axle and friction pins. A few more parts could have added something more than the little tow hook but this set already has loads of parts for the price. The third build is a Lotus 7 type, front engined roadster. In common with the other models, this car is solidly built for zooming across floors, using conventional techniques with a bit of SNOT on the side. This set provides good value for money. Its 286 parts currently retail in the UK for around £12.00 or $22.00 in the USA. For the same price, you get just 113 parts in the 79005 Wizard Battle set from the Lord of the Rings range. The set also includes some fairly rare parts. 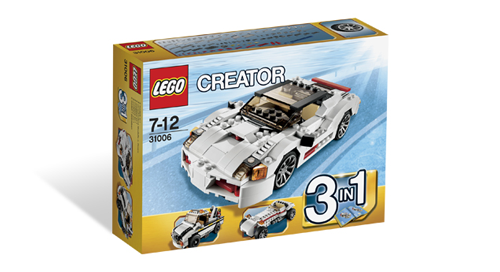 There are two of the white 93273 1x4x2/3 plate with bow, which currently sell on Bricklink for US $0.30 each and aren’t available from a UK vendor. A down side of all of the Creator series for younger builders might be the lack of minifigures. 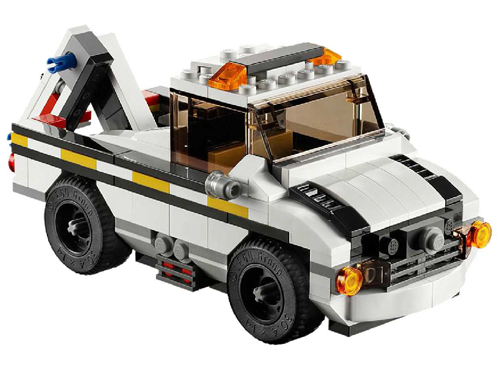 As we noted in the review of 31005, licensed sets are often minifigure rich but lacking in basic bricks with which to be creative and build your own creations. 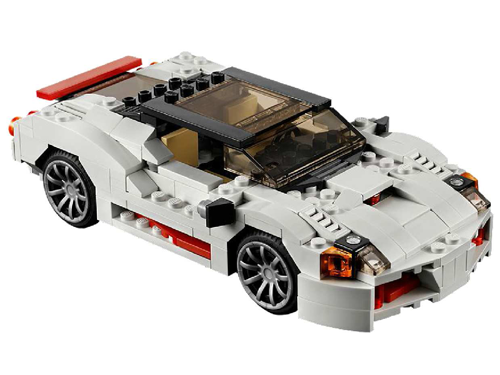 The 31006 Highway Speedster is a great source of a good variety of white bricks to help supplement any Lego collection. With its value for money, variety of parts and three different alternative builds, 31006 is a great set for the young or old builder. It rates a 9/10 for value & contents and perhaps just an 8/10 for style because of the lack of detail in the engine bay of the main build. If you’d like to see the complete catalogue of The Lego Car Blog’s set reviews simply click on the ‘Reviews’ tab in the menu. Well, what do you think ? I mean, look at it. Before I get down to it, a quick word about how we do our reviews around here. LEGO doesn’t send us review copies (yet; hint, hint…) so we spend our own money on sets for review, but these are sets that we’d have wanted anyway. This might explain the usually positive flavour of our musings; we’re not going to spend our hard-earned on something we know we won’t like. I haven’t reviewed the 42000 Grand Prix racer because I won’t be getting it. We do still try to be objective. Enough already, get on with it! So, to business. First impressions: Wow, that box is heavy! 2,600 pieces, plus motor and battery box would explain that. It’s the largest Technic set ever, by some margin. Not the most expensive, though, which remains the 8110 Unimog at a fiver more than this; which fact rather gives the lie to the notion of LEGO inflating their prices with each successive generation. You get 550 more pieces and a fiver in exchange for the ‘mog’s pneumatics. Fortunately, the bags are numbered to reflect the three main stages of the build. This isn’t quite the advantage it might be with the chassis forming well over half of it… Many, many bags all numbered ‘1’. Give yourself plenty of room. And time. That said, it never took me long to find a piece, and I never sort first as LEGO suggest. Lego 21103 Preview – Brick To The Future! Great Scott! LEGO’s Cuusoo scheme – where fans can publish their creations on the LEGO Cuusoo site, and those reaching 10,000 votes or more are considered for limited production – has generated its fourth fan-designed official LEGO set! m.togami and Sakuretsu’s mini-figure scale DeLorean time-machine from the superb Back To The Future movie franchise was recently approved by LEGO’s ‘Jury’ of designers for production, and The Lego Group this week released images showing how the set will look when it reaches stores later in the year. 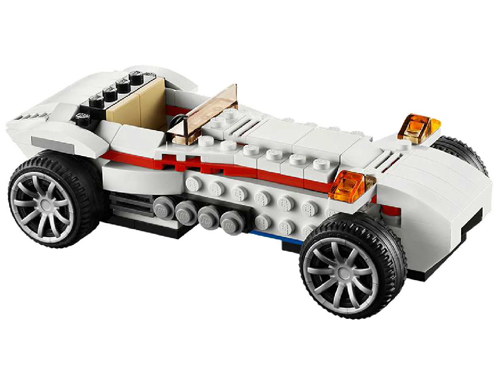 The new set – numbered 21103 – will contain 401 pieces, including both ‘Doc Emmett Brown’ and ‘Marty McFly’ mini-figures, a skateboard, and of course, a DeLorean with a few ‘modifications’. It’s too early for us to say what the pricing for 21103 will be, however the really cool news is that the designers have decided that the revenue they receive as a commission reward for creating the Cuusoo-winning product (1% of the total generated) is to be donated to the Michael J. Fox Parkinson’s Foundation. If The Lego Car Blog gave out awards for the heroes the Lego Community of 2013, m.togami and Sakuretsu are surely top of the list. So watch the video below, start saving, and join the discussion on Eurobricks. And congratulations to the winning duo, from all of us here at The Lego Car Blog, for making this exceptional project a reality. This superb photograph of the Circuit de Catalunya pit-lane exit, complete with 2013 Scuderia Ferrari Formula 1 car, was discovered on Brickshelf rather brilliantly just after the 2013 Spanish Grand Prix. It was built and photographed by lluisgib, and when we say photographed we mean it – there’s no photoshop trickery here! See how he did it at the link above. We’ve not blogged a Lego event for a while, so today we put that right by linking you to the awesome Truck Trial movement, pioneered by the Lego Users Group in Poland. LUGPol recently hosted their first round of the 2013 Championship in Warsaw. Truck Trial is a real life event in which beautifully modified trucks attempt to climb, traverse and descend around a fiendishly difficult off-road course. Like Motorbike Trials, the aim is to complete the course in the quickest time. Penalties are given for course infringements such as missing gates or getting stuck. Lego Truck Trial follows these rules, and adds in a few brick-related ones too. These include each truck requiring a complete cabin, on-board power supply through standard AA batteries, a working piston engine, and no more than two LEGO motors for drive. The courses in Lego Truck Trial may be considerably smaller than those used in the real events, but they are no less difficult. This leads to some epic driving skills and, when these fail, some hugely destructive crashes! Read the full Lego Truck Trail rules* here. Watch Lego Trial Trucks in action! To see past LTT Championship videos simply type ‘Lego Truck Trial’ into YouTube. Check out the full gallery from LUGPol’s Warsaw 2013 event via ManiekManiek on Brickshelf. *These may vary depending on the host country. Nathanael Kuipers is a talented sort of chap. Not only does he build amazing models, he also helps others to do the same. His latest work is not a model at all, but a book of instructions for 10 vehicular wonders that can me made from the same palette of pieces. Volumes 1 and 2 of The Lego Build-it Book are available to pre-order now from no starch press. Technic 41999 Preview – New 4×4! New for 2013! New Lego Technic 4×4 Crawler Redux! 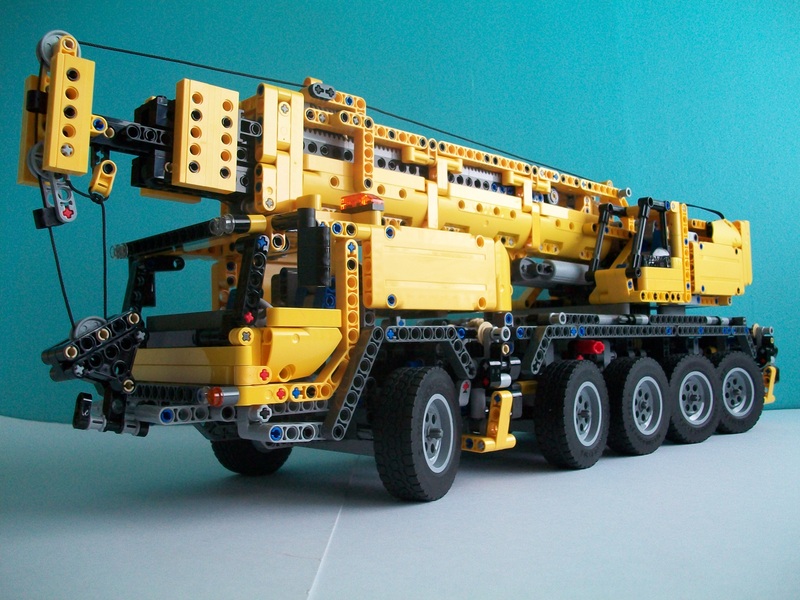 LEGO have added another new Technic model to their 2013 line-up! This brilliant blue muscle car monster truck was developed from the winning submission in LEGO’s ‘You design it, we make it!‘ competition held at the start of the year. Receiving the most votes out of the 10 finalists, Egor Karshiev’s Boss Crawler has evolved into set no. 41999, and comes in a fantastic new blue hue. Underneath the muscle car bodywork sits the chassis from the 2012 4×4 Crawler set 9398, and we think it’s even better looking than the original. Too see full details of the new set visit the LEGO Technic Designers Blog, and look out for the arrival of 41999 in stores soon!